PDF3D XML Server is the fast-access programming toolkit for developers who want the intuitive intelligence of ReportGen but with the built-in programming power and libraries of the PDF3D SDK Pro Toolkit. 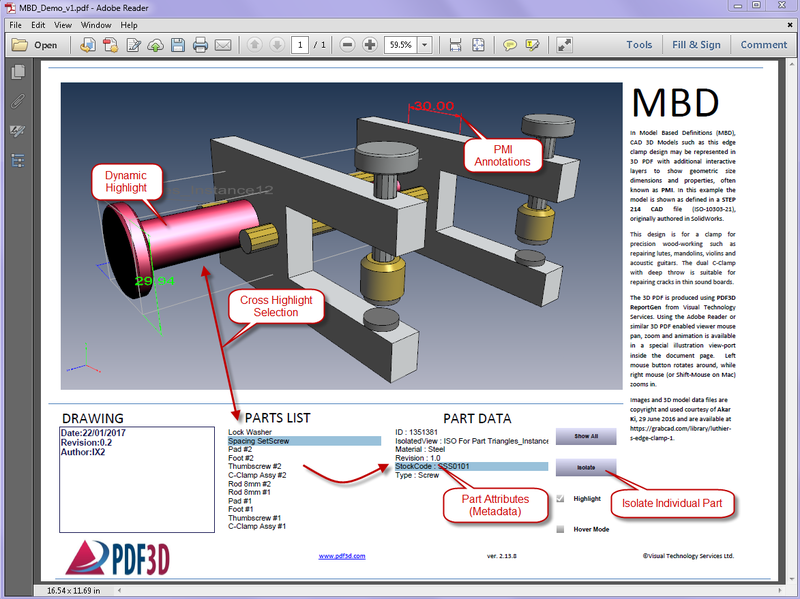 PDF3D XML Server integrates our 3D PDF technology into your system 10x faster than any other 3D PDF toolkit with a secure, customizable platform that automatically delivers rich, highly compressed, template-driven technical 3D models and simulations from multiple sources (such as STL, DWG, STEP, X3D, IFC, VRML, DAE). Request a trial and experience the speed and flexibility before you buy. CAD STEP Model with Metadata Part Attributes, parts list, cross-highlight, isolation and automatic sequencing. The PDF3D XML Server is a suite of programs, dynamic libraries and examples that any programmer can quickly integrate into their system to facilitate conversion of 3D models into 3D PDF file format, in the style of a file converter. This software development toolkit has been designed to be used by programmers with skills in scripting, web backend stacks and use of command-line and dynamic library services. Integration into existing software is much faster than traditional compiled program development making it ideal for small projects, batch automation, internal systems and desktop applications where it can be called to convert an intermediate format to 3D PDF. This file-based conversion process uses a rich XML-based API that supports over 70 different industry files and formats, and hundreds of customizable parameters and configurations that include changing scene lighting conditions, metadata and mesh quality and animation. 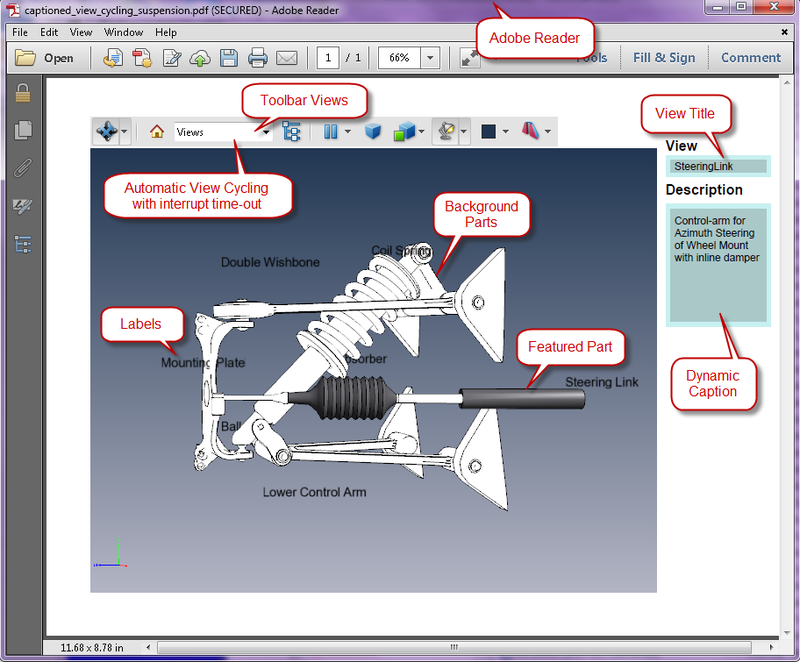 Document page text and graphics content and 3D conversion options are set via XML resources. PDF3D XML Server can be easily deployed through automation scripting (or to an online web server environment) to automate batch production of multiple 3D PDFs. It is not a single application, and does not include a user-interface layer, leaving you the freedom add your own controls. PDF3D XML Server gives you full control with total flexibility – if you want it. However, if you simply want to write a quick automated batch script, you won’t get weighed down in the complexity of the more complex PDF3D SDK Pro Toolkit, the best option for in-memory compiled code integration. Script the Commandline Interface (CLI) or load dynamic libraries (DLL) into your program, according your needs. If you ever need to upgrade, for every XML feature there is a corresponding C++ API method in PDF3D-SDK Pro. This PDF3D XML Server toolkit is as lightweight and fast as you want it to be. Automatically and intelligently process 3D model data, converting it into 3D PDF reports, applying a preset style or layout. Controlled by multiple programming and scripting languages, and is fully compatible with Windows, Linux and MacOSX. Let us show you round with a personalised, on-screen walk-through. This is all it takes to get started with a 3D PDF conversion. Just pass this to the conversion process through a DLL interface or Commandline CLI to convert a 3D model file to 3D PDF. A vast list of other tags can be added. On Windows, the software package is supplied as a vendor signed .EXE installer file. An email containing a transient timed validated download link from our secure cloud storage "depot" will be sent. After downloading, save this EXE on your local file system. Double-click or run this installer. Elevated administrative rights will be requested during the install process, as the installer creates registry settings and new entries into the desktop start menus. After installing, first run the PDF3D License utility. Use this to request a license. Administrator privileges are not required to request or activate a license. If firewalls or network policies block the license request communication to the pdf3d.com website, please push "show codes" and send these by any available means of communication.